Powers/Abilities: Milton Rosenblum is a talented attorney and is accustomed to handling difficult cases in superhuman law. History: (Defenders I#110 (fb) - BTS) - Milton Rosenblum acted as an attorney for years for Mr. Richmond of Richmond enterprises. He knew Richmond’s young son, Kyle, and watched Kyle grow up to take over the family business. Kyle eventually became the super-hero Nighthawk, member of the Defenders, and focused little on his family's business. (Defenders I#73) - Over the phone, Milton informed Nighthawk that he was being subpoenaed for financial reasons. 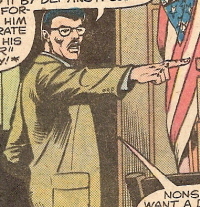 (Defenders I#74) - Rosenblum accompanied Nighthawk to the Defenders' headquarters where Nighthawk quit the team until his legal circumstances were worked out. (Defenders I#75) - As chauffer Harold drove Rosenblum and Richmond, Kyle was complaining about the unfortunate circumstances of the inquisition against him. He took a call and rushed off, ignoring his subpoena against Rosenblum’s advice. 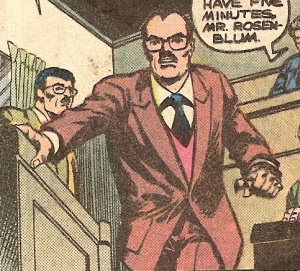 (Defenders I#83) - Working out of his office, Rosenblum and Stein, Mr. Rosenblum worked to convince Nighthawk of the seriousness of the charges against him. (Defenders I#84) - Rosenblum continued working with Nighthawk, and the two heard on the news of a possible war between Wakanda and Atlantis, hearing that further news would come from Senator Vance and U.N. Ambassador McHenry. (Defenders I#85) - Rosenblum and Nighthawk made great progress on cleaning up Richmond Enterprises’ business dealings. He turned off the television and stopped Nighthawk from rushing off to handle another emergency. (Defenders I#86) - After staying up all night to work out an arrangement, Rosenblum approached Nighthawk with the offer of a plea bargain, an idea Nighthawk was resistant to. Rosenblum watched Hellcat and Black Panther arrive, seeking aid, and demonstrating a Wakandan silencing technology. (Defenders I#88) - Richmond checked in with Rosenblum via phone, and informed him that he'd worked with Matt Murdock to overturn the injunction against Richmond becoming Nighthawk. They then watched Nighthawk's exploits against terrorists on television. When Nighthawk returned, Rosenblum informed him that the courts decided to press charges for fiscal malfeasance, income tax evasion, and other crimes. Murdock's skills impressed Rosenblum. (Defenders I#89) - Rosenblum lost his cool when men froze all of Richmond’s assets, including all the possessions in his apartment, until the investigation was over. He kicked a table in a fit, breaking an expensive vase. Richmond bid him calm down as they greeted Hellcat, Valkyrie, and Hulk (Banner). Hellcat got a call stating that her mother had passed, and Rosenblum agreed to make the funeral arrangements. He later attended the funeral and conferred with Richmond, who retrieved his Nighthawk costume from Rosenblum’s trunk, afterward. (Defenders I#90) - Rosenblum represented Richmond in court before Judge Clark, the state being represented by Mr. Haverhill, who was strongly opposed to Richmond in his opening arguments. Rosenblum took a call from Matt Murdock, who told him Daredevil needed Nighthawk’s aid, and Rosenblum told Nighthawk. Soon Hellcat and Fem-Force, under sway of the Mandrill, burst in the room, interrupting proceedings. The battle grew out of control and went elsewhere, and the judge chose to postpone the hearing. (Defenders I#91) - With Judge Clark now under Mandrill’s control, she began ordering the heroes confined. Rosenblum tried to calm Nighthawk, who flew from the room with his allies in fast pursuit. (Defenders I#96) - Rosenblum met with Valkyrie and the now paraplegic Richmond at his office at Rosenblum, Rosenburg, and Fummetto. He was shocked to see Richmond this way, and Richmond stormed out when Rosenblum showed pity. Valkyrie asked Rosenblum to do his best to keep Richmond out of court for a time while they took care of him, and Rosenblum agreed. (Defenders I#103) - Richmond (now crippled), with his nurse Luann Bloom, came to a meeting with Rosenblum and Murdock in which the court finally determined that if Richmond paid $767,000 in back taxes, they would drop all charges. Outside, a man named August Masters claimed to be behind the dropping of the charges. (Defenders I#104) - Attending a party with Valkyrie, Matt Murdock, Gargoyle, Hellcat, Luann Bloom, and Nighthawk, to celebrate Nighthawk’s legal resolutions, Rosenblum and the others were quickly attacked by some of August Masters’ men, including Hanson, who gassed the heroes and took them captive. Rosenblum strangely identified himself as Sydney R. Rosenblum, perhaps to throw the attackers off. (Defenders I#110) - Rosenblum received word from Nick Fury of S.H.I.E.L.D. that Richmond had died in battle. He broke the news to Luann Bloom, who stormed out, refusing to believe it. Comments: Created by Ed Hannigan, Herb Trimpe, and Mike Esposito. 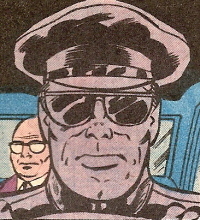 (Defenders I#90) - Judge Clark presided in the state vs. Kyle Richmond (Nighthawk); the state was represented by Mr. Haverhill, Richmond by Milton Rosenblum. Judge Clark did her best to handle interruptions, including a call from Matt Murdock and an unruly Valkyrie, before Hellcat and Fem-Force, under the sway of the Mandrill, arrived and Judge Clark was put under Mandrill’s control as well. With the courtroom crashing around them, the judge chose to postpone the hearing. (Defenders I#91) - Now under Mandrill’s control, Judge Clark began calling the trial in his favor, but her efforts were ignored and the heroes leapt free one by one. (Defenders I#76 - BTS) - Davies called Nighthawk to let him know the aggressive weapons package for his Nighthawk costume was ready. (Defenders I#75) - Kyle Richmond’s chauffer, Harold drove Richmond and Mr. Rosenblum, Richmond’s lawyer, toward New York City before Richmond took a call and rushed off. (Defenders I#90) - Haverhill represented the state vs. Kyle Richmond (Nighthawk) before Judge Clark. He considered Nighthawk a criminal and demanded prosecution to the fullest of the law, though Richmond’s lawyer, Milton Rosenblum disagreed. 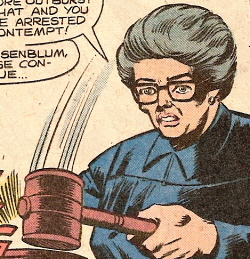 Rosenblum delayed court to take a call from Matt Murdock, and an unruly Valkyrie was almost arrested, before Hellcat and Fem-Force, under the sway of the Mandrill, burst in and chaos reigned, the courthouse came crashing down around them and the judge postponed the hearing. (Defenders I#84 - BTS) - Secretary Vance and U.N. Ambassador McHenry stated they would bring further announcements to the news regarding the potential Wakanda and Atlantis conflict.